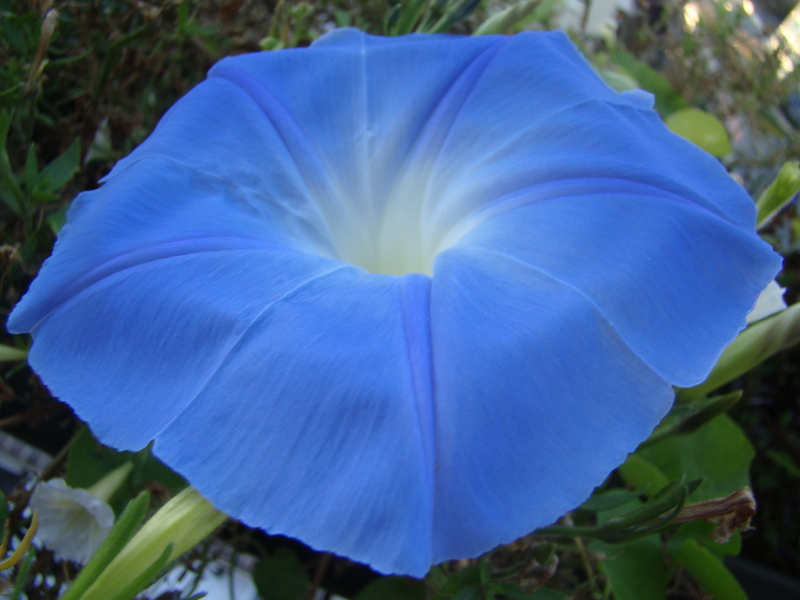 And even more amazing is the flower at the top of this post! Shown from two angles, it’s amazing first for its magnificence — dig the double blossoms — and second, for the fact that I have no idea what it is and no record of planting it! Weatherwise here in Chicago, while we’ve definitely put the autumnal equinox in our rearview we are still getting pushback from the season past, with some fairly glorious sunny 80 degree days of late. Today was most definitely one of Mother Nature’s gifts. Still, fall is intent on getting the last word as the sunny days are followed by chilly nights; so we’re cherishing each remaining moment spent in the garden and trying to come up with ways in which to extend its time line. What are you doing to get the most out the waning days in the garden? And if you’re one of my blogging friends with a year-round garden climate, what (if anything) changes when you move into a different season? Oh so magnificent! I am sure these blooms are sizeable. 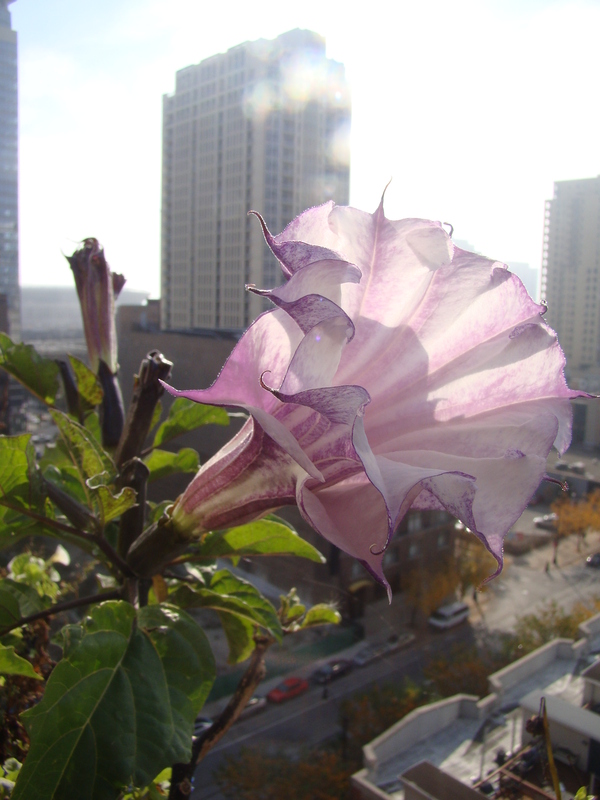 The first one, datura? It’s so lovely. And your morning glory is so pleasing. We are experiencing inconsistent weather nowadays. Sometimes it will rain for a number of days non-stop and now really hot for three days already. The plants that I have out in the open, they will have to be very adaptable. 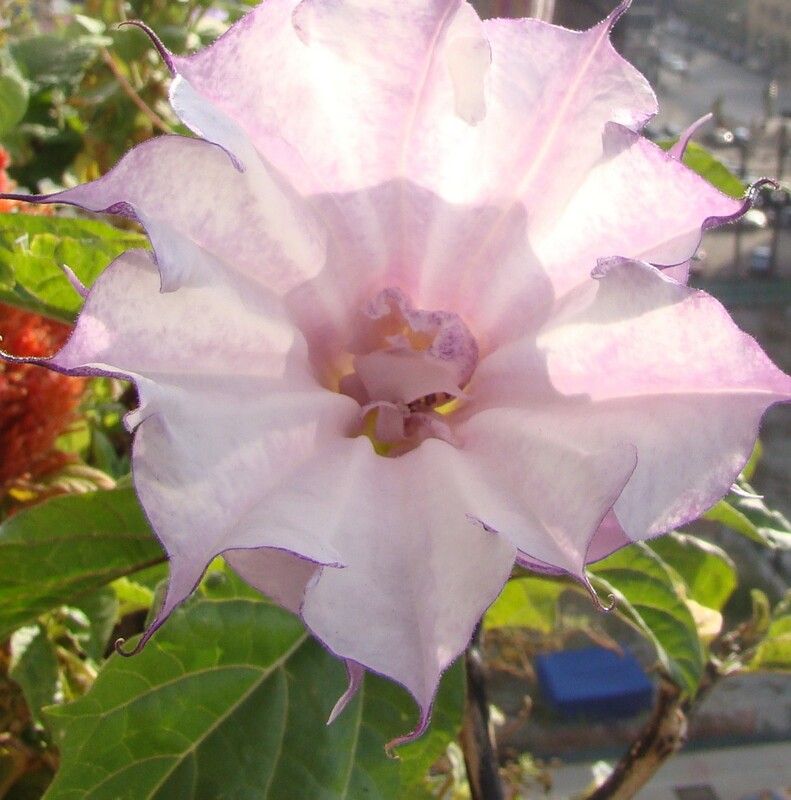 This is really curious, because I did have seeds from years ago for Angel’s Trumpet, but for yellow ones… I may have planted a couple of those, but again, this flower is white and purple, not yellow. I wonder if they may have placed the wrong color seeds in the package… Weird, huh? gorgeous blooms! I would also like to know if any changes happen as tropical gardeners move from one season to the next! Just stumbled across your fantastic blog! I’ve been growing plants for the first time this year on my three sunny windowsills so great to read about someone else who is cultivating an aerial garden. I’ll definitely be back! How lovely that you’ve still got flowers blooming. My garden is covered in a blanket of snow at the moment, very early for snow here. All my gardening plans have had to be put on hold.